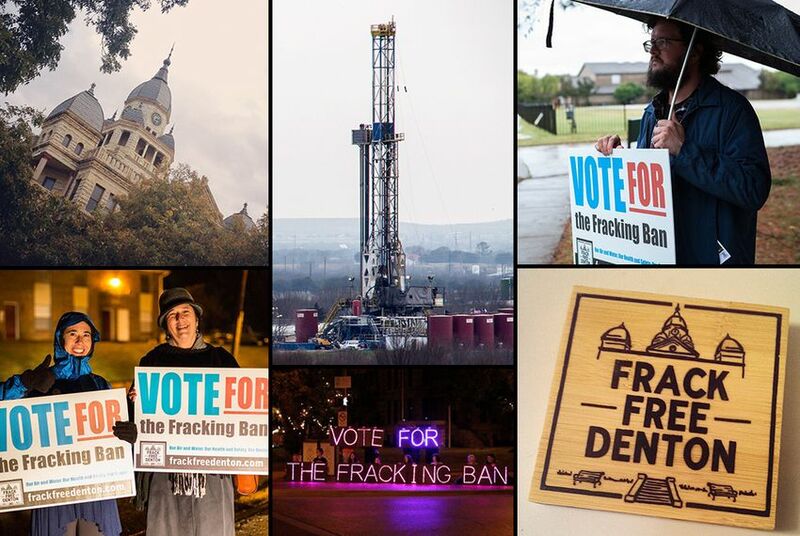 State lawmakers, the oil and gas industry and national environmental groups are asking deep questions about Denton, home to two universities, 277 gas wells and, now, thanks to a group of local activists, Texas’ first ban on fracking. *This story was also published in Politico Magazine. The town had company on Election Day. Voters in Athens, Ohio, and two California counties — three of the seven other communities that weighed in nationally — rejected the practice. To supporters, the North Texas city has taken a stand for clean air, clean water, public safety and quality of life. To opponents, the ban is the result of activists sowing fear and misinformation, threatening the economy and confiscating property — mineral rights — thousands of feet below ground. If the ban in Denton (population: 123,000) isn’t the biggest play in the national debate, it’s certainly the most interesting. This is Texas, after all. The state was built on oil and gas and is at the forefront of the most recent fossil fuels bonanza. Though threatened by plummeting oil prices in recent months, Texas is pumping more than twice the oil it did three years ago — more than 700 million barrels of crude in 2013 — accounting for more than a third of all U.S. production. It also produces about a quarter of the nation’s natural gas, more than 7 trillion cubic feet last year. “You can already hear the environmentalists saying, ‘If we can win in Denton, we can win anywhere,’” he says. Denton sits on the northern edge of the Barnett Shale, which stretches some 5,000 square miles beneath 25 Texas counties and pumps millions of dollars into state and local economies. That includes Wise County, which shares Denton County’s western border. It’s where George P. Mitchell pioneered the combination of horizontal drilling and fracking in use today. 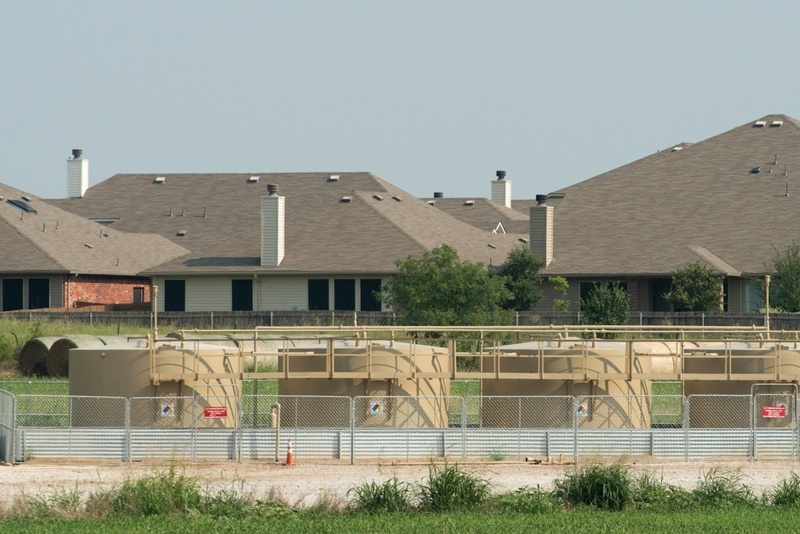 A gas well last fracked in March sits less than 400 feet from a home in Denton, which just became Texas' first city to ban fracking. The ban hasn’t completely turned off the spigot on Denton’s natural gas, but production will dwindle as long as it’s in place. Without fracking, companies cannot stimulate gas locked in the Barnett Shale. Operators can keep pumping from wells they had already drilled and fracked, but they can’t frack them again. Without that option, the flow weakens over time. Meanwhile, companies are unlikely to drill new wells that can’t be fracked. Still, representatives of major oil and gas companies joined Texas lawmakers to try to ward off the ban at a marathon city council meeting last July. Industry representatives told voters that a ban would ruin Denton’s economy and expose the city to millions in legal claims. Two state oil and gas regulators and the industry-funded group that opposed the ban insinuated (without evidence) that grassroots activists were in cahoots with the Kremlin — looking to protect Russia’s share of the global natural gas market. So, how did a North Texas town come to reject a tool that has been instrumental in the state’s economic well-being? It seems it was equal parts concerns about health and the environment and a good dose of NIMBY. But Denton's voting records cast doubt on that argument. It’s not clear that college students turned out in high enough numbers to single-handedly tilt the vote. Voters closer to campuses overwhelmingly supported the ban, as well as Democrat Wendy Davis in the race for governor. But plenty of conservatives also rejected fracking. Both Republican Greg Abbott, who ultimately defeated Davis, and the ban prevailed in 11 of Denton’s biggest 33 precincts. Roughly 25,000 votes were cast in the fracking question and those opposed to fracking outpaced supporters by some 4,400 votes. Denton would have still passed the measure by 412 votes even if voters younger than 30 were disregarded. Voting data also shows that the average age of a voter was 52. McMullen is a prime example of such a voter. When McMullen and her husband arrived in Denton in 2009, they were trying to escape heavy drilling and fracking that spilled onto their 11 acres of ranch land in Wise County. The noise, lights, fumes and traffic were horrible, McMullen said — different from anything she experienced growing up near conventionally drilled wells in East Texas, where bobbing pump jacks dotted the landscape. McMullen says she suffered constant headaches and suspects that benzene — whether wafting from a compressor station, tank battery or fracking itself— was the cause. (When a jury later awarded her Wise County neighbors, Bob and Lisa Parr, nearly $3 million in damages from the company that fracked those wells, McMullen felt her worries were validated. The verdict is under appeal.) McMullen and her husband sold their ranch home in Wise County shortly after an industry tanker fatally struck one of their friends, she said. Just two weeks after the couple moved to Denton, McMullen said she noticed Range Resources pounding in stakes across the street from the park, sizing up the corner as a gas site. She and some of her new neighbors called for the development to be moved elsewhere on the large lot, but the council, fearing litigation, ultimately permitted the development. From that point on, McMullen, who rarely voted until she reached her 40s, became an activist, organizing a group to push for tighter drilling rules as the industry expanded its footprint in Denton. Over time, they succeeded — at least on paper. The city updated its drilling ordinance in 2013, for instance, adding 200 feet to its previous 1,000-foot buffer between drilling sites and homes, schools, parks and hospitals. But that changed little on the ground. The rules didn’t prevent developers from building houses near existing wells, and people kept buying them. In fact, homes are still cropping up in those neighborhoods. What’s more, Denton's fire department in the city’s early drilling days issued permits for some well pads in perpetuity, meaning operators could drill as many wells as they wanted without further approval from the city. Depending on how one sees it, Dallas-based EagleRidge Energy either exploited a loophole or strictly adhered to the law by drilling wells as close as 200 feet from homes. In October of 2013, the city sued the company for drilling too close, but it quickly withdrew the lawsuit after a judge denied its request for a temporary injunction. An EagleRidge well blowout that year worsened the tension, spewing benzene and other chemicals into a neighborhood and prompting evacuations and flight diversions at the city's airport. EagleRidge declined interview requests. So with input from a lawyer who has remained anonymous, McMullen and the other activists decided on a last-ditch remedy: Use the ballot box to try to ban fracking. By the spring of 2014, they had gathered close to 2,000 signatures — enough to put it to a vote. But would any of this have happened — would McMullen have even become involved — if that well pad had been installed down the road, farther away from her home? A real David and Goliath story? Sure, says Bobby Jones, sipping a Diet Coke at a Cracker Barrel off U.S. Highway 380. If the pro-fracking side were David. Jones, a round-faced, round-bellied general contractor and rancher, is a local face of Denton Taxpayers for a Strong Economy. The group — funded almost entirely by energy companies — was formed to oppose the ban. For seven generations, his family has owned 82 acres on the west side of town. They own the minerals, too. Jones says the development on his land hasn’t caused any problems for him, his two kids, five grandchildren — or even his cattle, which sometimes graze near wellheads. “In my age and older, you were brought up to know and respect the minerals,” he says. It’s true. Few Denton residents own the mineral wealth beneath their property. That happens frequently in Texas, where mineral interests are “severed” from surface property. Energy companies and large corporations own around 80 percent of the roughly $88 million below Denton, according to 2013 city appraisal data. That leaves some minerals for the city, local schools and other public entities, and even less for everyday residents, giving voters less motivation to support fracking. The ban shouldn’t immediately impact Jones because his wells won’t be ready to be fracked again for several years. But Randy Sorrells, his buddy and fellow mineral owner, had expected new frack jobs for his five wells early next year. If the ban survives, Sorrells won’t be able to go forward with his plans. But Denton’s undoubtedly the underdog now. With the votes tallied, Texas and the energy lobby shifted to offense, racing each other to sue first. At 10:20 a.m. the morning after the election, the Texas Oil and Gas Association — the state’s biggest petroleum group — announced its lawsuit. Just four hours later, the Texas General Land Office, which manages millions of acres of state-owned property, blasted a release about its challenge, noting the filing time: 7:51 a.m.
“This ban on hydraulic fracturing is not constitutional and it won’t stand,” said Land Commissioner Jerry Patterson, calling it “arbitrary, capricious and unreasonable” and a threat to the state’s royalty interests under Denton, which flow into a $37.7 billion fund that benefits public schools. “If it were allowed to be enforced it would hurt the school children of Texas,” he said. The minerals Texas owns in Denton were worth just $45,000 in 2013, according to city tax data. George P. Bush, who is set to succeed Patterson in January, will continue the litigation, says Trey Newton, his chief of staff. “However, we can’t comment on pending litigation,” he added. Because of current shale economics, both the state and petroleum group argue, the measure amounts to a ban on all drilling, essentially confiscating mineral rights. They also say state law trumps Denton’s. Where fracking falls on that spectrum is unclear. Texas courts have occasionally considered cities’ drilling regulations, but they have yet to see a case of such size and scope. The case will almost certainly reach the Texas Supreme Court. Some legal experts say Denton could make a compelling argument that a fracking ban would not wipe out all options to drill. After all, drilling technology lets operators tap resources thousands of feet away at various angles. Some companies might reach Denton’s gas from outside city limits. But the lawsuits cite Texas Supreme Court cases calling production in the Barnett Shale “entirely dependent on hydraulic fracturing.” Texas courts have traditionally given great deference to the property rights of oil and gas interests, and the Texas Oil and Gas Association in 2014 contributed $25,000 each to three Texas Supreme Court justices who won races. The industry’s lead attorney in the Denton suit is Tom Phillips, the chief justice of the Texas high court from 1988 to 2004, now with the law firm Baker Botts. The lawsuits are asking for an injunction and for Denton to pay the industry’s legal fees. Even if Denton prevails, it could still be on the hook: Mineral owners will likely sue, asking the city to pay tens of millions of dollars — if not more — for the gas they can’t extract without fracking. But it’s not shying away from one now. The well pads near McMullen’s home and others throughout Denton were silent on a chilly Tuesday in December, the day fracking became a misdemeanor inside the city’s limits. There were no trucks rumbling down Denton’s roads, hauling sand, chemicals or millions of gallons of water. No haze from the drill sites wafting into the Texas sky. What's unclear is whether the stillness will last. Disclosure: T. Boone Pickens has been a major donor to The Texas Tribune. The University of North Texas is a corporate sponsor of the Tribune. A complete list of Tribune donors and sponsors can be viewed here.